Total Solar eclipse 1999 in France. Credit: Wikipedia, by Luc Viatour. A spectacular "ring of fire" solar eclipse Sunday will regale skygazers in South America and southern Africa, with seafarers in the nearby Atlantic getting a front-row view too, astronomers say. The eclipse—during which the Sun will all but disappear as the Moon crosses its path—will be most visible in a 100-kilometre (62-mile) band cutting through Chile, Argentina, Angola, Zambia and the Democratic Republic of Congo. A so-called annular solar eclipse occurs when the Earth, Moon and Sun line up. But even when perfectly aligned, the Moon is too far from Earth to completely block out the Sun, creating instead the impression of a fiery ring. 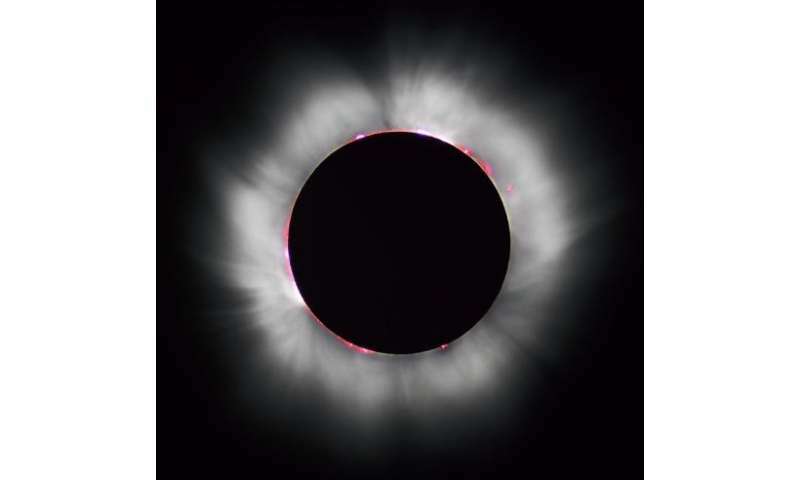 At first, it will look as if a "bite" has been taken out of the Sun, said Terry Moseley of the Irish Astronomical Association, stressing that viewers should not observe the eclipse unfold with the naked eye. "This 'bite' gradually gets bigger and bigger as the Moon—which is itself invisible—moves further and further in front of the Sun," he told AFP. "As about 90 percent of the Sun is covered, you'll notice a distinct drop in temperature and brightness, and a change in the quality of the light which is hard to describe." As the day darkens, birds and animals may enter a night-time routine, thinking sunset is nigh. At the height of the eclipse the Moon will be right in the middle of the Sun, leaving "a perfect, beautiful, symmetrical ring" of light around the edge before exiting on the other side, said Moseley. For people just outside the band of optimal viewing, the phenomenon will appear as a ring thicker on one side than the other, said Moseley—"not symmetrical, but still an amazing sight." Anyone further afield will see little or nothing. It will take about two hours for the Moon to move across the face of the Sun, but the "ring of fire" peak will last a mere minute. Starting in the southeast Pacific Ocean at sunrise, the eclipse will hit solid land at 1221 GMT in southern Chile, near the town of Coyhaique, then cut through Argentina—near Camarones Bay on the eastern coast—before hitting the South Atlantic. At sea, the eclipse peak will last 44 seconds and "only be visible to any ships that happen to be in the right place at the right time," said Moseley. It will reach Angola south of the town of Benguela around 1515 GMT, then move to Zambia and DR Congo just before the Sun sets and the light show ends. According to the Astronomical Society of Southern Africa (ASSA), the eclipse can be safely observed using a basic pinhole projector. Punch a tiny hole in a piece of paper with a sharp pencil, hold it into the Sun, and project the image onto a second sheet. The gaps between tree leaves make for a similar effect on the ground, says the ASSA website, calling this "the coolest and safest way to watch a solar eclipse". To look at the Sun directly, one would need special glasses. Weather is the only potential spoiler. NASA's eclipse website recommends watching the weather forecast a day or two before the eclipse, and picking somewhere with a cloud-free prediction. "Good weather is the key to successful eclipse viewing—better to see a shorter eclipse from clear sky that a longer eclipse under clouds," it says.